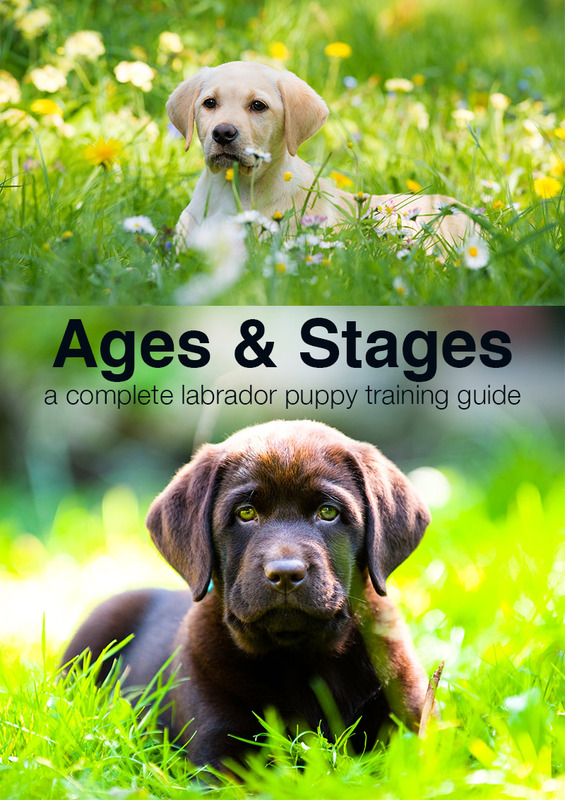 [wp_ad_camp_5]From 8 weeks on our puppy training schedule guides you through ages and stages of Labrador puppy training. It is very tempting to get carried away with puppy training. These little Labradors are so willing to please and such fun to be around. But it is important to go at a ‘happy’ pace. Obviously we don’t want to be ‘correcting’ tiny puppies. And this can easily creep in if we ask too much too soon. So what should we be doing with a puppy at two or three month’s old? 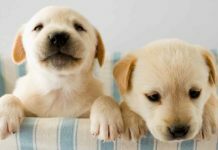 What are the stages in training that a puppy should pass through? No two trainers will ever agree exactly on this one! [wp_ad_camp_2]This may not be exactly the same for each Labrador puppy, especially with retrieving. However, it gives you a rough idea. I’ll also give you some general ideas of what to expect from a puppy at each stage. Follow me: Encourage the puppy to walk after me and keep close to me outdoors, by walking a few steps one way, and a few steps another. Constantly changing direction. Stopping frequently for cuddles and rewards. Recall: Lots of puppy recall ‘phase one’ training. This means I blow the recall whistle whenever the puppy runs towards me, no compulsion, and no whistle unless the recall is already underway. Socialisation: Lots (almost daily) of outings to different places rural and urban (carried) Visits to family and friends. Working with food: Learning how to take food gently without snatching or grabbing at the treat pot. Walk next to me: Introduce clicker heel to get the puppy walking alongside me in the heel position on my left hand side. Recall: Now I start introducing the whistle as a ‘signal’ to trigger the recall. I still give the puppy lots of encouragement by running away as soon as I blow the whistle. Hand touch: I teach all new puppies to touch my hand with their noses. This is a great foundation for other skills. Check out my instructions and video. It’s fun! Walk on a lead: If she is ready for this, I start to slip a lead over the puppy’s head for very short periods as she walks next to me. Recall: Puppy recall continues, reduce my run to a walk, avoid any distractions. Still frequently blow the recall whenever the pup runs towards me of her own free will. Bite inhibition: No biting, gentle mouthing allowed. Retrieving: Continue to build drive. Getting into a bed/basket: I introduce the idea that sitting in her bed while we eat is a great way to get treats. Positions: I introduce three positions – sit, stand, down. Most three month old puppies will be sleeping through the night. And will be having less potty training accidents in the house. There are a few potty training problems that arise at this age, and they are all covered in 15 potty training problems solved. Many people will have started to teach their puppy to ‘sit’ at this point and that is fine, my only caution would be not to start asking such young puppies to stay for more than a second or two. I also like to get small puppies acquainted with the idea that getting in their bed while we eat is a great idea. I have a pot of dog treats on our kitchen table, and whenever we sit down to a meal, the puppy gets a treat each time she steps into her basket. No pressure, no ‘stay’. Just a treat for stepping in there. Many four month old puppies will be pretty much potty trained. They will however still be prone to accidents if left for too long. 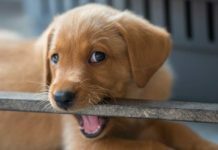 Biting is usually starting to subside now, and many four month old puppies will be able to mouth at your hand without hurting you. At this point I start to discourage all mouthing. This is the age at which people often start to push forward with training. And many four month old puppies are capable of quite a lot. There is nothing wrong with teaching your puppy different cues and even some tricks. 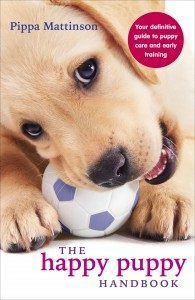 You’ll find ideas and instructions in our puppy training guides. I recommend you still avoid long duration activities at this point as they are a common stumbling point with puppies young enough to have a short attention span. I wouldn’t expect a four month old puppy to walk at heel for long distances, or to stay in his basket for an entire meal for example. A ten second sit is ample. Recall: Fade additional cues. Begin to whistle the pup and stand still. Add mild distractions. Bite inhibition: No more mouthing. Clicker train to polish this in more mouthy puppies. This is where I start a programme of gundog training with my Labs. You can begin raising your standards and expectations, asking for longer and more complex behaviors. Or teaching your puppy to sit and stay for longer periods of time, and even while you go out of sight or while other dogs play nearby. This part of training is called proofing, and you’ll find plenty of help in our individual training guides and in our proofing articles. Six months is a common time for people to have a lot of questions and to be struggling with a few challenges. Don’t panic. 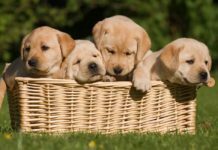 We have a great article for owners of six month old Lab puppies. Head over there and you’ll find you are not alone! Some people train a good deal faster than this and achieve quite impressive results with quite small puppies. I come from an era where gundog puppies were left ‘untouched’ until 8 or 9 months of age. They were given time to mature and just be puppies before training commenced. This was partly because training methods were much harsher in those days. These days I tend to do more with each puppy at a younger age, but there is also some virtue I think, in not expecting too much. 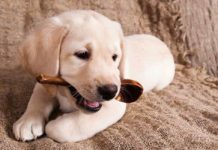 As far as I’m aware, there is no evidence to suggest that puppies that are ‘hot-housed’ from an early age, make more obedient, or better mannered dogs. So don’t worry about rushing your Labrador into ‘school’ at eight weeks old. You have plenty of time to enjoy your puppy and work slowly through a gentle but effective long term training programme. You can find out more about your puppy’s developement in the Puppies section of our website. Next articleWhy Do Dogs Lick? Hi we have a 5 month old lab. She is completely house trained in the kitchen, hall and living room and also when we go round to friends/family. However, when we open up the dining room for her to go in, she has an accident. Does anyone know why? We are trying to gradually open up the rest of the house to her but it hasn’t proved quite as successful! Yeah they drink a lot of water. I have a 8 week old puppy and I was told when I got him to just leave a pan of water out for him at all times. We got a Lab who is 32days Old. His vaccination is yet to be done as I have been informed by Vet that 45 days is when he will get his first vaccine. As I am naive have very limited information about Labs. I and my wife both works and he has to stay alone for 5-7 hours in a day. He poops and pee around the Hall and that too very often. very are not very sure of this behavior and how could we teach him about it. we want to train him for Poop & pee outside the home and when we are not in the home he should do to the very specific place. Moreover how often we should feed him and what should be the time to feed him? Any advice will be mush appriciated!! I have a 9 week old lab puppy male, we live next door to the mother and 1 puppy that the family kept. We are having huge problems training him as he wants to continue going next door any suggestions on making the transition easier? Hi i jave a 4 month old lab/ rottweiler / husky mix. We are having issuses with her bitting and jumping up and knocking down my kids. How can i train her to stop these bad habbits? Hi I have a 5 month old puppy who refuses to stop peeing inside. I barely manage to clean one mess up and he makes another. This seems to be worse if I’m correcting him for getting into something or correcting the other dog in the home on something. What can I do to stop this? My puppy Ditto is going to be 5 months old this May. I noticed something with him that if I raise my voice because he did something wrong, he’ll look for things that I own and ruin it or focus his anger on it. Is it possible that dogs have tantrums? We have a 16 week old black lab. She refuses to potty train. We’ve tried everything except pads (which I am sure she would just drag around the room and tear to bits). We want to train her to be an indoor family dog. We’ve had to keep her in her outside kennel most of the time because she is so unpredictable. Literally she could to pee outdoors and bring her in and she will look at you and pee again. She has all the other Lab characteristics as well. Her activity, biting, jumping, is of concern too, but I think if we could get over the potty training hurdle, we could concentrate more on the other behaviors. Thank you. hi! i bought a lab pup he is two point five months old now. i love him so much and he’s so adorable. some people say that he’s a low quality dog, as in, not of a very good breed. what i get from them is that my dog is not as full bodied or plump as other labs his age. but i do not care, after all he’s a dog and i love him and more than anything else he loves me soooo much…..
my 9 1/2 week black lab is going in the bathroom in our home more than he was before he came home and we live next door and have been around sence he was born and he always went out side as a younger pup and did ok first week or so home but is now not going outside at all. he will walk out the door come back in and pee. is there anything to maybe help on direct it in another way? i know he is still just a puppie but its something he already un learned. My puppy is almost 4 months old and he seems to bite too much and very fiercely too. Is this normal? Is there any way to control this behaviour? I purchase labrador 6months male dog yesterday can i teach command him or is it too late or can he still be trained ? We have an awesome 6 month fox red pup. At home she is really good, calm, great recall. But whenever we go to my boyfriend parents house they just have so much going on that she pays absolutely no attention to us! We’ve started keeping her on a leash when we go for walks or just hanging out in the yard but she starts pulling on the leash when she has been getting better about pulling and heeling at home. It’s almost like all her training she has been taught just went out the window. Hi, i have 3 months old female Labrador. I have done her potty training in bathroom as i stay in an apartment alone.But some times if she pees in the room she goes and sleeps above it.she has been doing it since i brought her.i don’t know how do i change this habit of her. hiii there my dog is 1 year old but does not listen or obey . is it too late or can he still be trained ? I have 50 days old labrador puppy he is always biting humans, clothing could you please help me to recover from biting. . . I have a 12 week old black lab. I read a lot of people are feeding they’re dogs roughly 4 cups of food a day, instructions on my bag suggests 2 2/3 cups a day (science diet ideal balance) he was weighing 26lbs at just under 12 weeks. what do you think? Why would you teach sit at four months? Makes no sense at all. If you are rewarding the puppy while teaching commands then what is not fun about that? Plus the puppy sees it pleases you and that’s what a puppy wants! If you are happy with what the pup is doing and rewarding along with affection the puppy will love it! My lab pup Molly is a month and she’s still in the habit of biting ur hand when ur playing. She knows how to “sit” and “shake” she still has accidents in the house. But when she goes to other houses like my moms she goes to the door and whines. How do I fix her potty training to wear she does it at home too? Do you mean she is a month old? Or that you have had her for a month? We have a black lab cross (Australian Shepard) who is 10 weeks old and we have had him since 7 weeks. He goes to work at a shop where my boyfriend is manager everyday and loves kids and adults. He is socialized reguarily with other dogs, is house trained within 3 days of us having him and is a very good listener. My only concern is he does not like being alone. We do not crate him, he sleeps on the floor at night. We have tried crating him for 30-45 minutes each day to get him used to it… And he cries until he puts himself to sleep. Is this normal? When he cries we leave him be so he is shown no attention as a ‘cop out’. His dandriff is also really bad, but being in Canada and it being winter, is it because of the cold and dry air? Hi pippa. How do you handle the puppy when doing urban or rural socialisation before formal heel training? I found with our black lab that early lead work introduced very bad heel habits that took a lot of time to put right. I regret using a lead and taking her out so much before 6 months in the name of “socialisation”. Would love to hear how you do this. Our dog is great now. Strong retriever. Test winner so in the end all was ok.
Hi, I have a 26 week old German Shepherd/Black Lab mix. We rescued him at 11 weeks old. We have successfully taught him sit, down, and paw. We are really working on leave it, drop it, and here/come. However, he seems to have some tricks of his own… He likes to eat the decorative rocks we have in our fron yard. He chews them and either spits them out or swallows them and poops them out a few days later. He does not like the bitter apple spray so we do use that, but he stops for a second and continues again! Our other problem is that he get random bursts of energy and starts “attacking” us. Sometimes even biting so hard that he punctures (slightly) through the skin. Another thing he des is jump up on the counter to sniff around. He just reached 45 pounds and is tall enough to reach the counter by jumping perfectly! We have tried loud noises and sternly saying off, but usually these methods of training do not work. We do not want any of these things to turn into something worse and would appreciate any help you can give. Thanks! I have a 3 month old pup from the shelter. He has been crouching to play, jumping, growing and biting hard. 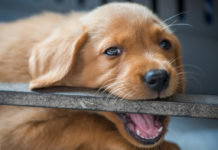 How Do we stop the biting behavior? Hello, my 8 week old lab Diesel wont stop biting wood and other rough things, this is not a problem as long as im with him but when I have to leave the house I cant be sure of what he’s doing. I tried keeping him outside when i leave but hell just start barking and do all he could to come back in again. I really dont prefer to crate him, so do you propose any good solution to stop this biting cause im worried he might swallow something bad for him.. and thank you. Hi there, we have an 8 week old puppy that we have just bought home, he is adorable and we are all gettin used to each other. My question is, what age should we be thinking about taking him to puppy classes? The class teacher said that as long as he has clearance from the vet then he can come before his 2nd jabs, is 8 weeks old too young for puppy classes, should we perhaps wait until he reaches 12 weeks? Thanks. my puppy is a mixed breed, his mother is a Croatian Sheepdog, but the father was a Labrador. Most of his characteristics are like the ones of a Labrador. He is only three months old, and he already knows how to walk on a leash (without pulling) and the basic commands (sit, lay dowm, stay) and even the give me your paw command. He is extremely smart and fairly obedient. Our only problem is the nipping and when he gets mad he something bites me, very lightly, but still unacceptable. I don’t really know how to deal with that problem. Also he still sometimes pees and poops in the house… Advice? A question about the length of TIME re continuing C/T for a behaviour (such as recall). I have a great little labrador X that is now 5 months (mainly kelpie) – I’ve had her since 10 weeks. Reading the amount of proofing you incorporate into training I see my expectations have been far too high. I only use COME as a cue around the house. I struggle with the proofing because I feel a need to give her lots of exercise (if she’s not asleep, she’s RUNNING) but lack areas without distractions SO .. I’m constantly running away and hiding behind trees and signs then whipping around and pretending I called her when she charges back to me. I do short sit/drop proofing sessions while out on her walks tied on leash to a pole (maybe 3 min max at a time). I do think I’m progressing but she remains SO interested in EVERYTHING (ants on the ground, birds in the sky, etc) !!! My last dog was trained with positive reinforcement/food rewards but was older and picked things up very quickly. I faded the food rewards quickly (replaced with life rewards and occasional food surprises) so the amount of treating that goes with the clicker and proofing makes me nervous. I do vary it (e.g. sometimes just verbal praise and a little play) but is it okay that I’m still C/Ting her almost every time. She sits or drops/waits for door, food, lead, etc – 10 seconds only – plus lots of other behaviours in progress (touch, on your mat, fetch/retrieve – in play only, weave – play with a toy only, spin/twirl, heeling – short bursts, loose leash, etc). Should I be backing off on other behaviours until sit, drop, recall and leashwork is solid? P.S. I live alone and she has access to me all the time (except 5 hours a day at work and when I am in my office which she is blocked from except when being supervised). Hi Pam, that is a busy little dog you have there. I tend to work on one or two things at a time but if you and your dog are happy with your fairly intensive programme of behaviours, there is probably no need to ‘back off’. I seem to remember one recent study did show that dogs that had a couple of breaks in training, each week retained information better than dogs that train every day without fail, so you might want to take that into account. My puppy Bessie is 8 months, we are working on recall as she was developing a habit of totally ignoring me, she was also pulling like a train on the lead. After a week of very intensive training she is getting better. I plan to get your book as soon as I can. Hi, I got a puppy at 4 months and I have been trying to get recall training into him. Unfortunately he still is a very stubborn little thing. Mouthing is ok but he will still bite my mum and dad, but not me. Lead walking is horrible as he’ll get too excited and get distracted it worries me when we start letting him roam free outside in the yard. This also means housebreaking has been an issue for me and he refuses to go outside but will do his business on newspapers in the house. How do I make sure that the other two strays dogs outside(apparently they adopted us and have been around over the years,but have been protecting the home from strangers and small animals) don’t take him out on the road. Should this be part of the obedience training? I want to make sure he remains within the house compound and not leave whenever we’re at home or out of the house when we transition him from an indoor dog to an outdoor dog. I got him so he’ll be a companion for my mum who’s retired and has a lot of time in her hands. But my dad thinks he will be good for mum so she’ll be a little bit more responsible at home. (Career woman, not house trained). Hi there, your 4 month old puppy is still very much a baby. Learning to recall, walk on a lead etc with distractions around him is a long process called ‘proofing’. You can read all about it here: Proofing: an essential part of training your Labrador. There is absolutely no way of ensuring that the stray dogs outside will not take your dog off adventuring with them, or of ensuring that your puppy does not roam on his own initiative. The only way to keep a dog safe outdoors when you are not able to watch him is by providing a secure fenced area for him. Paddy will be ten months on 6th Nov,he has been an easy pup, hose trained within a week and did well at puppy and junior school. He is very sociable with any other dog and most people however, we have a couple of problems. When my husband walks him, Paddy will rush up to people and start barking, not polite and rather intimidating; he does not do this with me. My problem is that Paddy seems to spend ages going out for the last wee at night. He’s perfectly happy while I stand shivering on the doorstep! He tries to come back into the house without obliging and it has now become a battle of will! I take Paddy out for an hour and a half each afternoon, returning about 5.00pm. He does not go out again until 10.00 or 10.30 and is then in the kitchen until 7.30am. Surely 5.00pm – 7.30am is far too long for him to control his bladder? I just ordered Total Recall. Are the articles on this site covered in the book? When you say blow a whistle do you mean an ordinary athletic whistle and can a clicker be used instead? Is this better than using the command “come”. The equipment you need is covered in the book. The role of a whistle and a clicker are totally different with respect to recall. The whistle is a cue (command or signal that the dog needs to take some action) a verbal command such as ‘come’ is an alternative cue. A clicker is normally used as a reward marker, not a command or cue. You do not need to use a clicker in order to use the recall training programme in Total Recall. All this is explained in the book. The articles in this site cover many topics not just recall, so no, the articles in this site are not all covered in the book. Hi Pippa , we have a gorgeous chocolate boy named Errol 12 weeks old, he sits for us and is brilliant at his puppy recall as you say he doesn`t want to lose me . I have learned such a lot off this site , although I think he is really clever he does occasionally have his chocolate moments !! The one thing i am struggling with is using a clicker , errol totally ignores it , once he has seen and eaten the first clicked treat he won`t leave me alone for couple of minutes and then when I try clicking when he has engaged in something else he doesnt respond , ive read how to proof the clicker but what ever I try he doesnt react to it .He isn`t deaf ,thats for sure , what do you think I am doing wrong ? It sounds as though you are making long gaps between one c&t, and the next one. So that Errol is losing heart in getting any kind of interaction from you. I think perhaps that is my fault for the way I have worded the charging instructions. You need to get the puppies interest for him to learn the connection between click and treat. So I suggest you get him interacting with you by rapidly clicking and treating many times for a minute or so. Repeat several times a day. And don’t ‘spread out’ the C&T until he has really grasped the connection. Use something really tasty to help quickly form the link between the click and the treat. Hi Shane, this is a common problem and I have posted an article this morning which I hope will help you and others. It is called ‘How to play safely with a Labrador’. Pippa. I am just starting to teach her to ‘sit’ using small treats. I wouldn t leave it till she was 4 months old I don t think. Am I doing it too soon? We’re certainly having fun!! And I will take on board the stuff about proofing.